St. John is truly a tropical paradise, with pristine natural vegetation and wildlife along sandy white beaches and stunning waterfront views. Incredible landscapes stretch out for miles and turn from land into sea, making 1,277-foot-tall Bordeaux Mountain an amazing vantage point. This towering St. John mountain is a famous island destination, and can be reached by hiking the Bordeaux Mountain Trail. Discover a taste of nature on your hike up Bordeaux Mountain on St. John and enjoy the lush trailside vegetation on your way there! Find out more about all of the great hiking trails on St. John, from the Reef Bay Trail to the Bordeaux Mountain Trail, when you read our Blog. 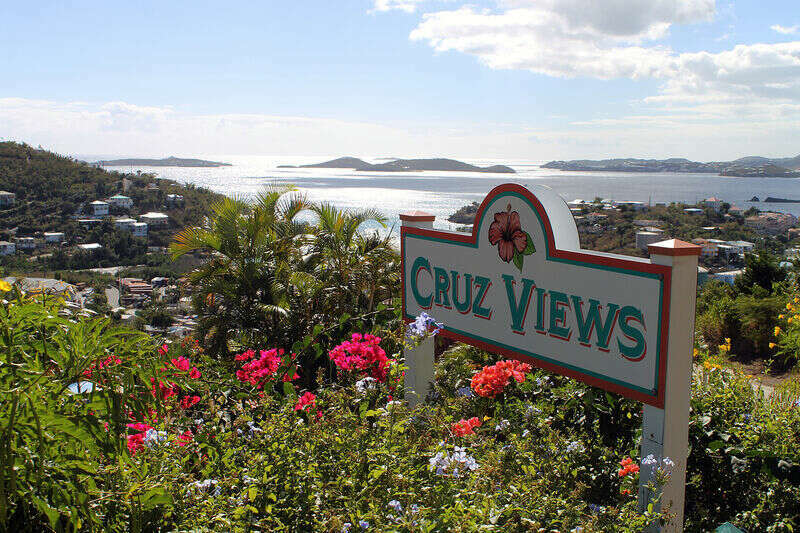 It features some great information on all the wonderful activities and attractions you can enjoy during your stay with CimmaronStJohn! To ascend Bordeaux Mountain on St. John, USVI, you must begin at Little Lameshur Bay on the south coast of the island. Here, you will discover the starting point of the Bordeaux Mountain Trail. A short dirt road leads to a small parking and picnic area, alongside the beach, and from there, the 1.8-mile hike begins. Walk along a rough, sun-exposed access road before a sign directs you onto a more shaded trail. Pass geologic survey markers and enter an overgrown tropical forest as you get closer to your destination. Another mile of hiking will bring you to the Bordeaux Mountain Road, which leads to an unmarked use trail to get to the very top. The forest canopy hides most of the views at the peak, but this rewarding summit will bring you much closer to St. John nature! The Bordeaux Mountain Trail is not for the faint of heart. This more difficult hike features a steep, rocky climb that will need good shoes and balance to master. The challenging trail includes some great South Shore views on the way up, although the surrounding vegetation is a stunning feature all to itself. Though the trail is marked, it is not quite as clearly landscaped as some of the other island trails. Be sure you can manage the difficulty if you plan to take on Bordeaux Mountain and be cautious of slippery slopes if it has just rained! Though the peak doesn’t offer the most stunning of views, Bordeaux Mountain offers something else entirely. It offers your chance to be a part of St. John nature. As you ascend this beautiful mountain, you will discover warm breezes flowing through the vegetation and sneak peeks of Caribbean blue among the tree branches. The Bordeaux Mountain Trail will take you into the heart of St. John wildlife, away from the popular beaches and coastal attractions. It will take you to an authentic slice of lesser-travelled paradise that will make you feel as though you have truly experienced the island’s majesty! One of our properties closest to the Bordeaux Mountain Trail is the Maison Miele Villa. This 3-bedroom, 3-bathroom stone vacation home is located at the spectacular waterfront setting of Sabbat Point. This fabulous villa offers a private pool, beautiful garden, and all the modern amenities you could ask for. Walls of windows overlook the Caribbean Sea, and a constant trade wind breeze tickles the porch. Stretch out a hammock in the garden or laze on a chaise in the sun by the pool for incredible relaxation that you can’t quite experience anywhere else!